All Bear River City homes currently listed for sale in Bear River City as of 04/26/2019 are shown below. You can change the search criteria at any time by pressing the 'Change Search' button below. If you have any questions or you would like more information about any Bear River City homes for sale or other Bear River City real estate, please contact us and one of our knowledgeable Bear River City REALTORS® would be pleased to assist you. 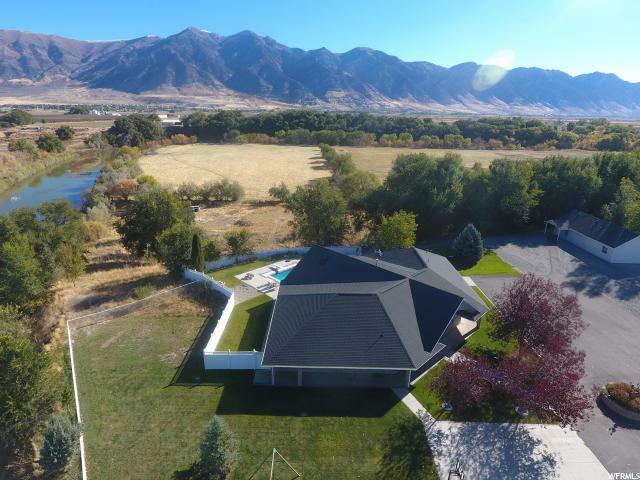 "This incredible, fully fenced, & private property was built right on the Bear River! It is fully handicap accessible! It has a beautiful 2,656 Sq.Ft. home, a separate 1,050 Sq.Ft. guest house, a tricked out 2,400 Sq.Ft. shop, an indoor/outdoor pool (more on this coming up), a football field, a dirt bike track, a volleyball court, RV parking & dump stations, river access with a cement boat ramp, & a plot for a future shop. You can control the gated entry, lights, intercom, & TV's from your tablet with the $10,000 automated system. All of the concrete is decorated & heated. The pool room is fan-freaking-tastic with a double-sided fireplace & double-sided saltwater fish tanks alongside, heating via solar panels connected to the 2 boilers, skylights & ceiling fans over the top, a diving board, a water slide, a basketball hoop, an auto-cleaner, a separate hot tub, plus TV's, intercom, & speakers. The pool is 16'X40' & is 10' feet at its deepest. The entire property is connected to a backup gas generator. See the attachment, Property Details, for more information because there is way too much to mention it all here! (The 2nd level is actually the separate guest house. Square footage figures are provided as a courtesy estimate only & were obtained from an appraisal. Agent is related to seller. Buyer to verify all information.) Check out the video by clicking the TOUR link!"